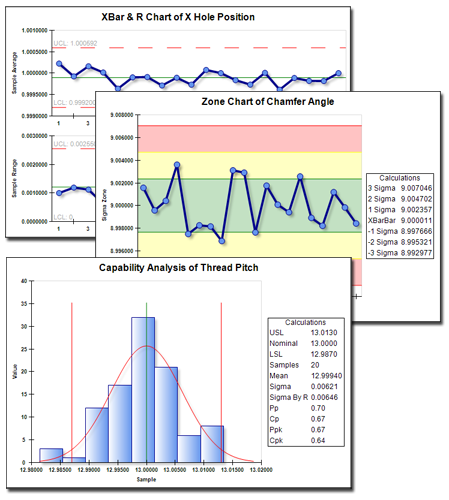 With Prolink Charting, you are only a click away from full color statistical charts. The charting package now comes built-in with the Buddy. All charting in the Buddy is currently supported. This includes the following list. Charts in the Prolink Charting package can be resized, copied/pasted into your report, and used in Excel Jobs via the Buddy. To enable Charting, simply download the SPC Office Buddy 3.4, go to Tools > Options > Chart Settings and choose Prolink Charting from the Chart Tool list. With Prolink Charting, you aren't only limited to charts. You will also have a whole list of statistical calculations at your disposal. Don't spend time setting up your Excel spreadsheet to calculate your statistics by hand. Instead just place tags in your template and replace them with your calculations in seconds. 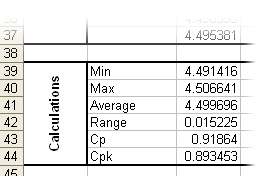 The Buddy currently supports all major SPC statistical calculations including Min, Max, Mean, Median, Range, Lower Control Limit, Upper Control Limit, RBar, Sigma, Sigma By R, Cp, Cpk, Pp, Ppk. In addition to the Gage R&R charting, the Buddy can also report your Part Variability, Repeatability, Reproducibility, and Total GR&R statistics as values in your Excel report.